Samsung is all set to announce new high-end Android tablets this week, on June 12, during an event called Galaxy Premiere 2014. Both of the tablets that should to be unveiled then - the Galaxy Tab S 10.5 and Galaxy Tab S 8.4 - already appeared in leaked renders and photos, so we know what to expect. However, before the official announcement, the Galaxy Tab S 10.5 was spotted in another set of photos, this time accompanied by new flip covers specifically designed for it (they even have the Galaxy Tab S name etched on the front). The flip covers come in black and white, and are attached to the tablet thanks to two proprietary connectors situated on the device’s back. 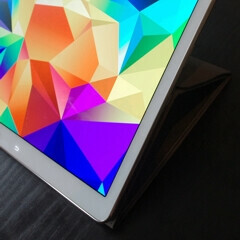 You can see the Tab S 10.5 and its flip covers in the slideshow below. The larger Samsung tablet that appears in some of the photos seems to be the Galaxy Tab Pro 12.2. Both the Galaxy Tab S 10.5 and Galaxy Tab S 8.4 will feature 1,600 x 2,560 pixels AMOLED displays, being powered by Samsung’s Exynos 5 Octa 5420 processor. They’ll also offer fingerprint sensors, 3GB of RAM, 8MP rear cameras, and Android 4.4 KitKat with the latest Magazine UX. As previously reported, Samsung may start selling the new tablets in late June. Is that your 1st post here? BTW, I don't mind if they don;t even have a camera. Never used a Tab to take any photo. Beastly tablets. Can't wait to see it. Its practically a sin to cover an amOLED display in any type of cover. This, ladies and gentlemen, is the sh*t.
the sh*t you've been waiting for?